Our test bed is ABIT’s i875P chipset based Max 3 motherboard with a 3.0 GHz Pentium 4 and 2 x 512 MB of memory. In order to show where the WD740 stands in terms of performance we ran the same tests with its predecessor the WD360 and Maxtor’s Diamond Max Plus 9. All these disks have an 8 MB cache which is becoming more and more standard for hard disks. 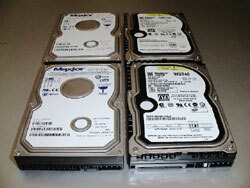 All disks were tested singly and in pairs for RAID 0x2. ABIT’s Max 3 features the Intel ICH5-R Southbridge with native RAID 0/1 support. More about this can be found in our original “Raptor” test report. Additionally we tested the WD740 also from the Max 3 onboard PCI based Silicon Image 3114 RAID controller. The results are not shown here, because they were just a fraction behind the results achieved with the ICH5–R. Our tests are assuming a desktop user / single user environment. We did not run any test simulating a server or multi-user environment. In order to check basic disk performance parameters such as transfer rates, disk access time, and burst rate we used HDTach 2.7, Sandra 2004 Pro, and DriveBench V0.3. We then tested the 3 disks with benchmarking programs based on applications that are usual for a desktop environment. Unfortunately there is currently only the rather dated Winbench 99 test program available for application based HDD benchmarking. WB 99 is running a collection of high-end desktop applications. They are I/O bound and scripted in such a way that they are intensively reading and writing from and to the disk. WB99 comprises among others 2 benchmarking test sets, one representing a business environment and the other one a high-end desktop environment. In addition we ran Content Creation 2002 and Business Winstone 2002. They as well are simulating PC usage with business and content creating applications such a Lotus Notes, various MS Office applications, FrontPage, Photoshop, and Sound Forge. In addition we used the very useful HDD benchmark included in PCMark 2004. This little test suite measures desktop system relevant HDD tasks, like Windows start-up and application loading time. These results appear on the next page.